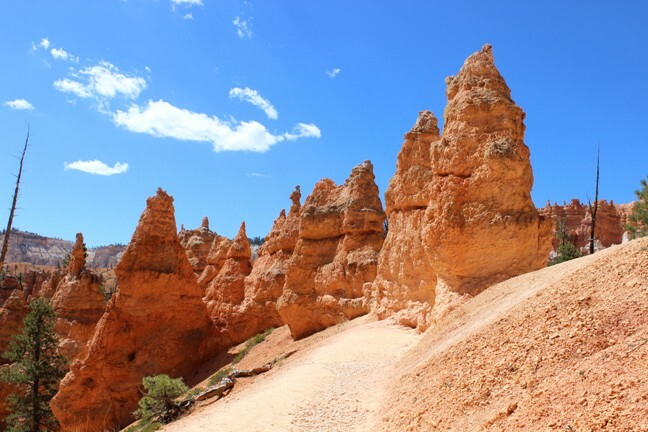 When I saw before me an endless valley blanketed in vast colonies of fantastical HooDoos, I knew I would not rest until I ventured deep into that valley for what would surely be a mind-blowing hike. 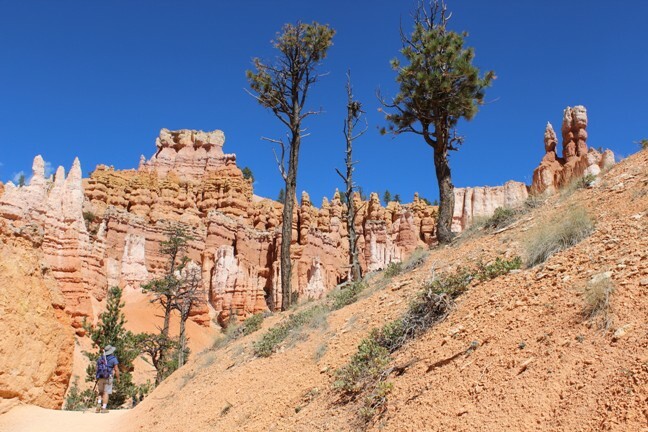 Ever since I made its acquaintance in early 2014, Bryce Canyon National Park is THE national park I wanted to revisit. 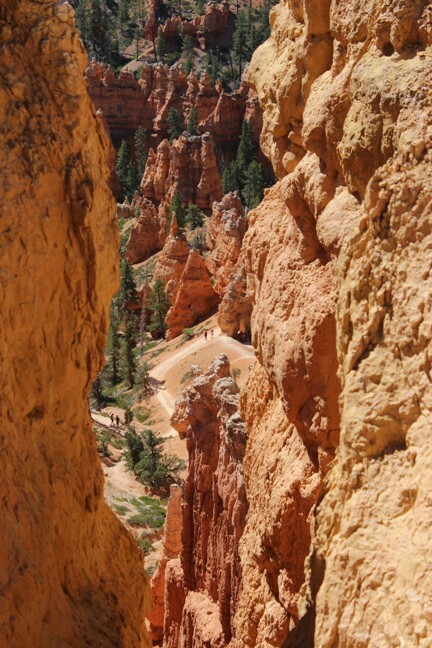 When first there, we’d only seen the HooDoos from high places like this, which was STILL pretty spectacular! 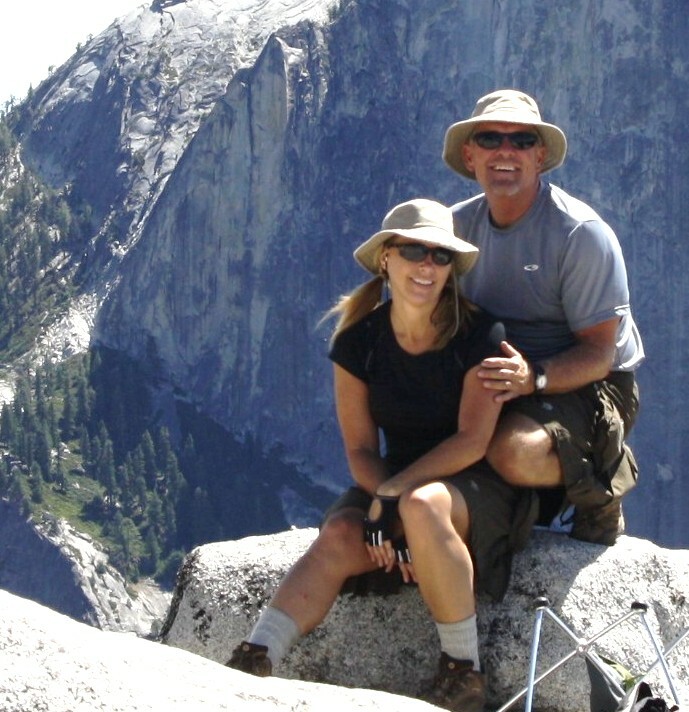 (See full details of the 2014 trip here: 3 Days, 2 Nat’l Parks, 1 Bum Foot: Miracles and Inspiration) . 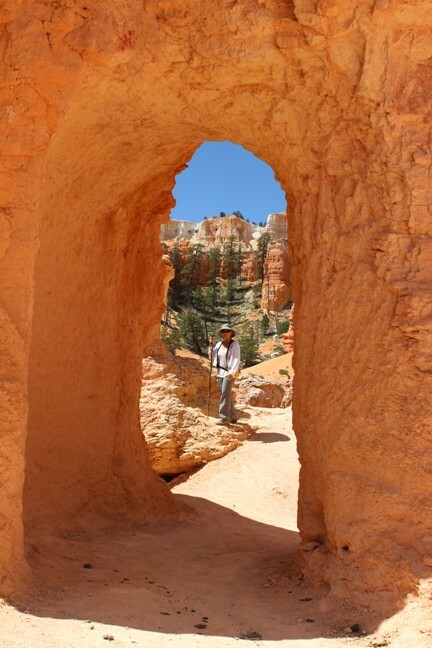 . .
Four months after the initial visit, I did venture down into that HooDoo valley. 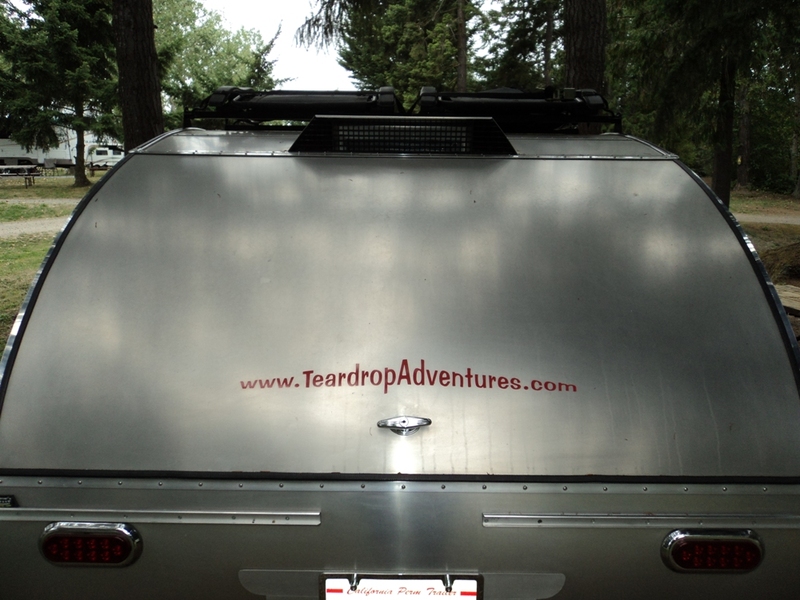 It was the second to last day of our three-week-long teardrop trailer trip and my mind was, as expected, officially blown. 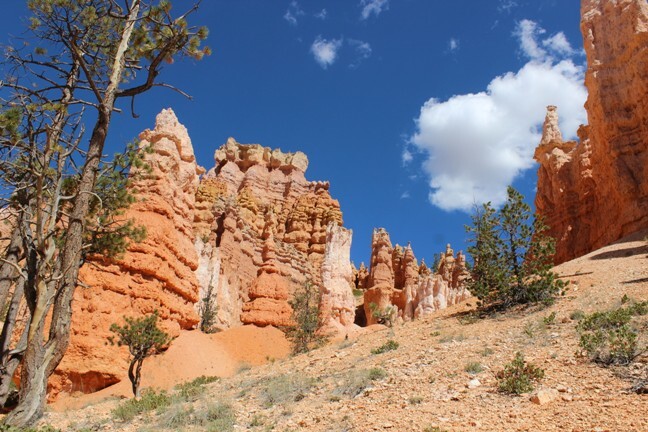 One of the toughest tasks I’ve ever undertaken was to whittle down two hundred twenty-five Bryce Canyon photos into a subset to share with you, my readers. 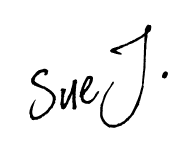 The best I could do is trim my full set of photos down to one hundred twenty. Since I don’t want you to be as saturated with Bryce as I was, without the benefit of actually being there, I’m splitting the photos between two different posts-half here, half on the next. You’ll think it impossible for a place to sustain its beauty and your attention for so long, but, believe me, it does and it will should you go yourself some day. A narrow walkway leads to this distant spire . . .
a spire which begs for a photo shoot. Who are we to decline the offer? But make no mistake . . . it’s a long way down should we slip and fall. Those specks below on the trail are people! . . . The trails are completely intriguing. Curved stone doorways beckon you to enter. 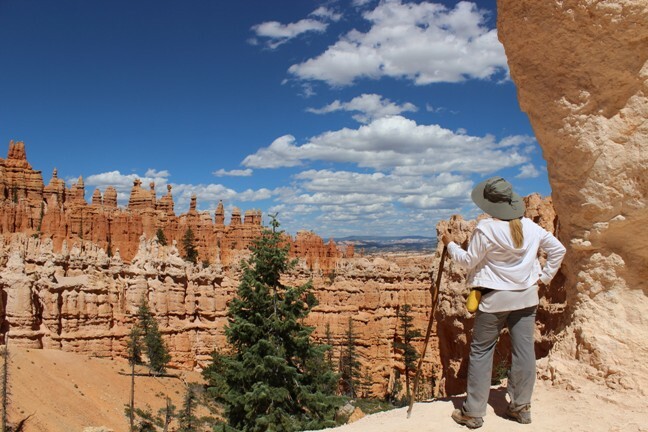 Bryce Canyon National Park is one of Utah’s “Mighty Five” national parks. It is, in my opinion, the BEST OF THE BEST in Utah, and that’s saying a lot. 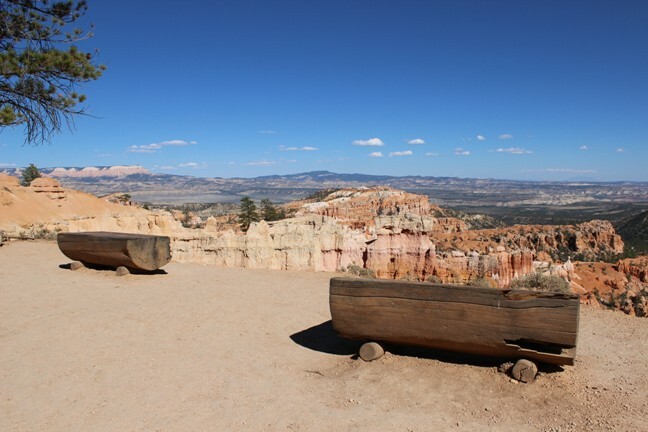 Utah is a MUST GO destination for mind-altering, highly accessible, unique scenery. 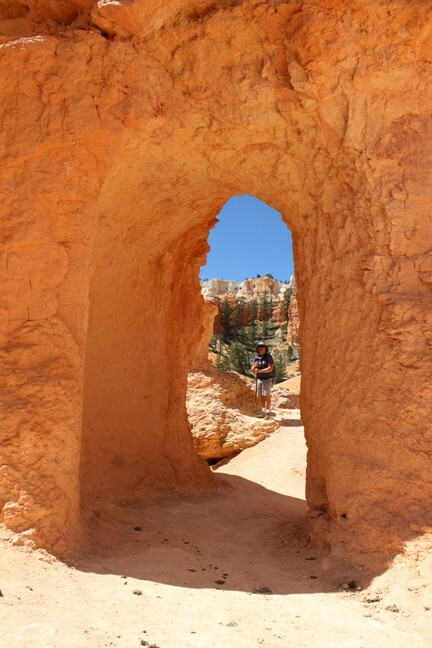 I did most of my hiking in Utah last year on a bum foot, courtesy of plantar fasciitis. I thought the three-week national park trip would be a bust because of it, but there were enough options (especially in Utah) to enjoy the parks to their fullest. 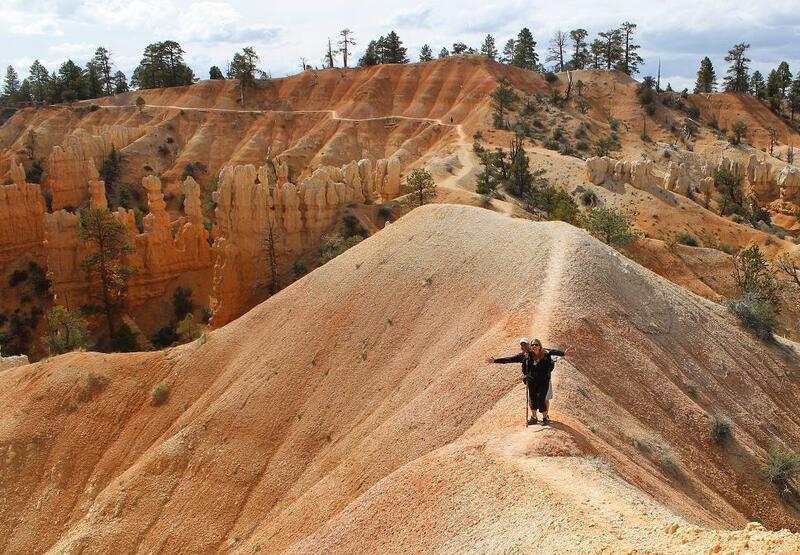 This particular hike was a huge commitment for me, more than I suspected I could handle with a recently injured foot, but I deeply wanted this HooDoo experience. We headed out on the Queens Garden Trail with the intention to “see how it goes” and either double back after visiting “the garden” (almost a mile down into the valley) or continue on. The nice thing about Queens Garden is you get a real bang for your buck. 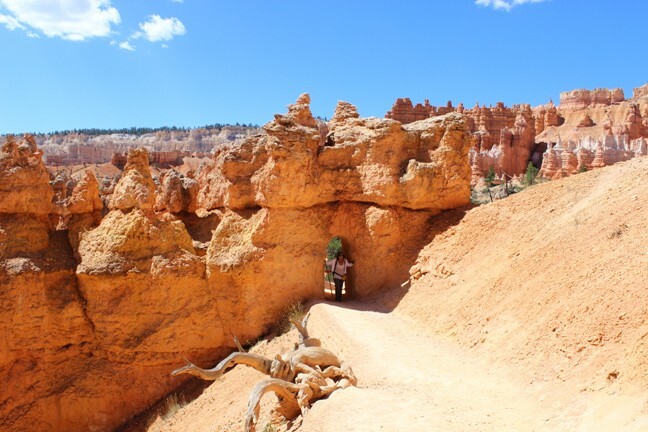 With just a two-mile commitment, you’ll be “in the HooDoos” and will feel momentarily satisfied. You’ll find shady places to hide from the sun and benches spread out along the trail that will be much appreciated on the walk back up to the top. And, of course, you’ll see the Queen looking out over her garden! 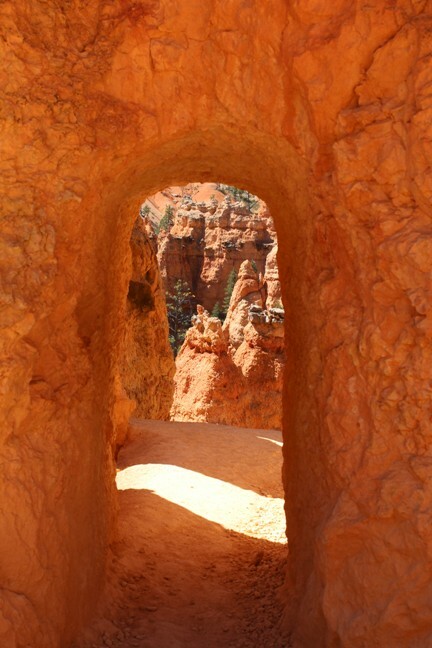 Vistas and passageways abound, calling upon you to stay and explore . . .
and you’ll have to decide, once out of the Queens Garden, whether to backtrack from whence you came or continue on other trails. I felt good at the time and chose to continue on. Should you ever do the same, realize that you are pretty much on the hook for the full round trip. At some point, it seems plain ridiculous to head back. 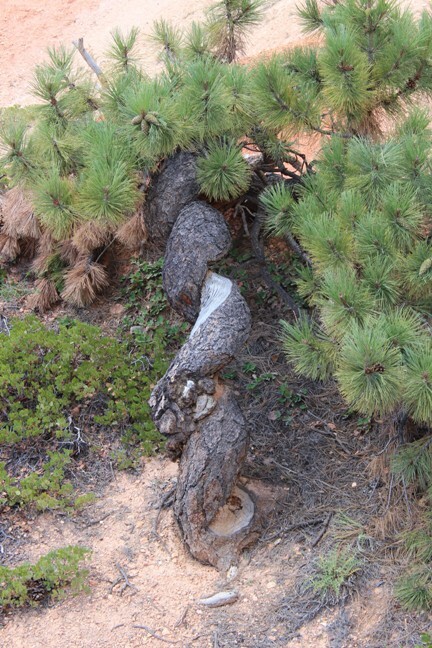 If you believe in mystical energy, you’ll find fallen tree branches drenched in powerful energy. 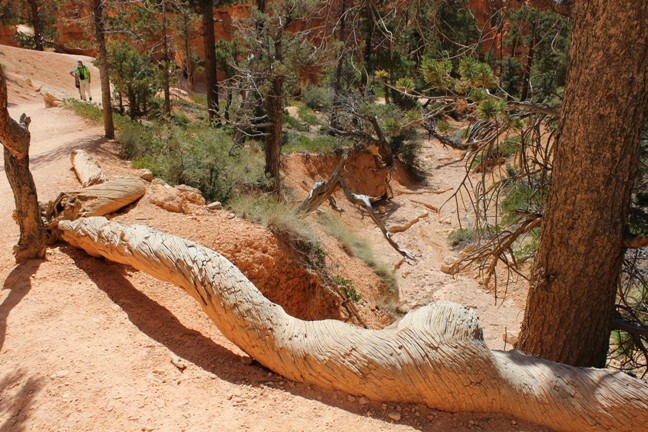 If you don’t believe, you’ll find instead really cool-looking fallen tree branches . . . Here are some other sights along the way . . .
All in all, we completed an eight-mile-long round trip, which took a solid four-and-a-half hours to complete. My foot stopped cooperating in the last two miles. Be forewarned that you have to drop down into that valley and, of course, come back up, but you also have to rise and fall many times throughout the hike to navigate the irregular landscape, up and over hills and often through them. Initially, I had this thought that I’d hike down into the valley, hike some more on mostly level ground, and then hike up out–not true. I had a hiking stick with me, which I strongly suggest you have as well (it gets steep in parts), and PLENTY OF WATER, even just for the Queens Garden trail. If you misjudged and didn’t equip yourself with these necessities, you’ll be happy to see this when you finish your hike. As for us, it would be five more miles beyond the Queens Garden trail before we would rest our eyes on this happy sight. 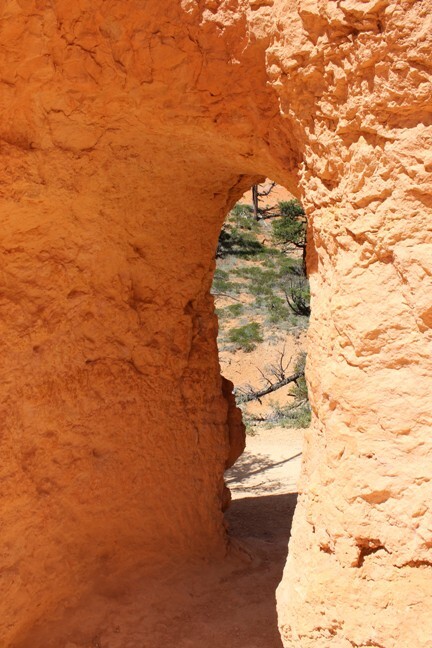 Instead, we continued on the Peek-a-Boo trail and finished out on the Navajo Trail. On my next post, I’ll share the rest of our hike. ‘Til then . . . Adios! Au revoir! And Happy Trails! We missed Bryce on our last drive through Utah but did get to hike Northern Zion. 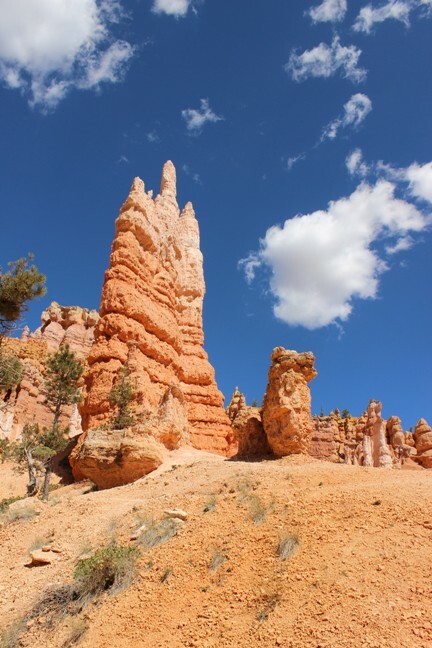 Our hope is to spend time exploring Utah and the amazing parks located there. Our favorite camping spot is Death Valley. Nothing like the great outdoors! We camp there most Thanksgivings. Great place to smoke a turkey with all the sides and a full and proper Thanksgiving feast! These are just beautiful photos. Call my husband to the computer nad say “WE MUST GO THERE!” photos. Bryce is definitely a must. Takes-your-breath-away beautiful! Your photographs are just stunning.